According to the research, conducted by the EUROMIG project’s staff, the construction business in Lithuania has been recovering after the crisis and is increasing its assets. The Lithuanian statistics shows that the number of construction companies and number of people, involved in construction industry has been increasing, especially since 2011 year. The Lithuanian construction sector can be characterized by a large quantity of little construction companies (9 and less employees). It should be noticed that such a characteristic makes industry and infrastructure profitable. The fragmentation of this sector allows to complete projects in time and with high responsibility. Moreover such situation gives more opportunities for small and medium enterprises development in Lithuania. Statistic data see in the table 1 below. It’s important to note, that in 2012 7,29 billion litas (2,11 billion euro) were assigned for construction work in Lithuania, what is 15,9 % more than in 2011 year. The volume of Lithuanian companies’ investment, doing their activity abroad, was 504,8mln. lt (146,3 mln. euro), what is about 6 % of total construction work done. The main activity of Lithuanian construction companies abroad – office buildings’ construction in Latvia, Sweden, Iceland, Norway etc. Moreover construction business in Lithuania is tightly connected with Russia, Belarus, Estonia, France, Germany and other countries. In 2013 new construction works carried out in Lithuania are constituted 43,9 % of all construction works, while reconstruction took only 29,7 %, repair and restoration – 26,4 %. At the same time it was a great difference between growth in activities – the new construction work increased by 21 % in 2013, in comparison to 2012 year, reconstruction grew only 9,3 %, other construction work – 19,3 % of growth. But repairs and restoration work showed drop by 2,9 %. See graph 1 below. There were 3467 new dwelling houses completed in 2012, what is 8,4 % more than in 2011 year. According to the general number of completed dwelling houses, this number constituted 5926 units in 2012, that is 13,5 % more than in previous year. The territorial distribution of construction companies’ activity and their work is different in the regions. 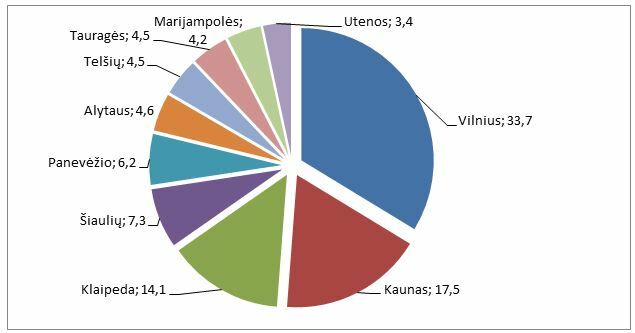 The main cities for construction work in 2013 were Vilnius (33,7 % of all carried construction work), where all spheres of construction industry developed rapidly since the crisis times, Kaunas (17,5 %) and Klaipeda (14,1 %). The lowest part of construction work was in Utenos – only 3,4 % among all. See the graph 2 below. The key construction materials, manufactured by construction companies in Lithuania, are: stone, wooden construction materials, roof products, prefabricated wooden houses, cement, glass etc. Such materials as thermal insulation, ventilation equipment, laminated wood beams, polymer-bitumen roofs and ceramic parts are the main innovative products, engineered, improved and manufactured by Lithuanian companies. The main advantage of Lithuanian construction companies is deep cooperation between them on the way to the goal achievement. High experience and possibilities for construction companies to improve experience abroad and overtake good knowledge make these companies highly competitive. Moreover the qualification of workers is really good, including engineering staff, with high level of responsibility and possibilities for the employees’ growth. The knowledge of foreign languages helps employees to make their work better and to take part in different trainings and seminars abroad, carried out by real professionals. Access to the sea in Klaipeda, good air, road and railway infrastructure enables to transport construction components and materials to any place throughout the world. Estimating the perspectives of construction business in Lithuania, the president of the Lithuanian Association of Builders Adakras Šeštakauskas admitted, that annual amount of construction works in the country can reach up to 9 billion litas (2,6 billion euro) per year till 2015, taking into account contemporary rates of growth. In general, nowadays the construction industry is developing rapidly, however, the construction business is quite difficult work. 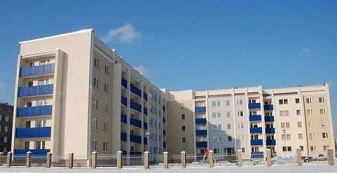 Therefore the specialists of EUROMIG project has developed concrete list of services, which will help clients to develop their own construction business in Lithuania, starting from setting up construction company, assistance in getting construction license, certificates, up to representation of your business interests in governmental and non-governmental institutions, signing agreements with suppliers of building materials. The professionals of EUROMIG project provide services of getting permits for building commercial or non-commercial buildings, other infrastructure objects, we will select a team of good and responsible specialists, engineers and managers.